The beloved poet Mary Oliver has died. During her lifetime, Oliver accomplished something few poets ever do. She not only made a living writing poetry. She was also a bestseller. Her poems often explore the link between nature and the spiritual world, and she won many awards for them. She died today of lymphoma at her home in Florida at 83 years old. NPR's Lynn Neary has this remembrance. LYNN NEARY, BYLINE: Mary Oliver got a lot of her ideas for poems during long walks. That was a habit she developed as a kid growing up in rural Ohio. It was not a happy childhood. She said she was sexually abused and suffered from parental neglect. But as she told NPR in 2012, she found refuge in two great passions which lasted her entire life. OLIVER: ...My pals when I was a kid. NEARY: Oliver published her first collection "No Voyage And Other Poems" at the age of 28. She went on to win the Pulitzer Prize and the National Book Award. But writer Ruth Franklin says such recognition probably wasn't that important to Oliver. RUTH FRANKLIN: I always had a sense of her as somebody who was just interested in following her own path, both spiritually and poetically. NEARY: In writing about Oliver's book "Devotions" for The New Yorker, Franklin said Oliver was not always appreciated by critics. But she was one of the country's most popular poets, and Franklin says there was a reason for that. FRANKLIN: Mary Oliver isn't a difficult poet. Her work is incredibly accessible, and I think that's what makes her so beloved by so many people. 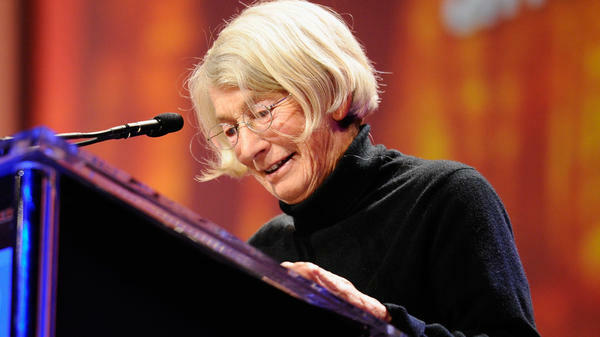 It doesn't feel like you have to take a seminar in order to understand Mary Oliver's poetry. She's speaking directly to you as a human being. NEARY: Oliver told NPR that simplicity was important to her. OLIVER: Poetry, to be understood, must be clear. It mustn't be fancy. I have the feeling that a lot of poets writing now - that they sort of tap dance through it. I always feel that whatever isn't necessary should not be in the poem. NEARY: Oliver lived for many years in Provincetown, Mass., with the love of her life, the photographer Molly Malone Cook. She continued her habit of taking long walks which often inspired her poems. She wrote of such a walk in "The Summer Day." OLIVER: (Reading) I don't know exactly what a prayer is. I do know how to pay attention, how to fall down into the grass, how to kneel down in the grass, how to be idle and blessed, how to stroll through the fields, which is what I have been doing all day. Tell me, what else should I have done? Doesn't everything die at last and too soon? Tell me, what is it you plan to do with your one wild and precious life? NEARY: Many of Oliver's poems are a joyful celebration of nature, but she also wrote about the abuse she suffered as a child and her first brush with death from lung cancer. All of Oliver's work, says Ruth Franklin, was infused with a deep spirituality. FRANKLIN: The way she writes these poems that feel like prayers - she channels the voice of somebody who it seems might possibly have access to God. I think her work does give a sense of someone who is in tune with the deepest mysteries of the universe. NEARY: In her poem "When Death Comes," Oliver wrote this about the inevitable. (Reading) When it's over, I want to say, all of my life, I was a bride married to amazement. Lynn Neary, NPR News. (SOUNDBITE OF KRIS BOWERS' "WHAT'S STOPPING US") Transcript provided by NPR, Copyright NPR.